Abraham was born four weeks premature and spent the first few weeks of his life in the hospital. When he was about two and a half months old, Abraham’s parents noticed that he was losing weight. At three months, he began vomiting blood and broke out in a rash that covered his body. After being taken to the ER, doctors discovered not only was he dehydrated but his kidneys had stopped working. 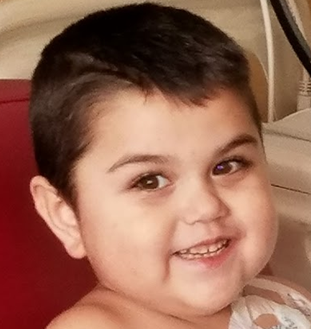 He was immediately sent to Doernbecher Children’s Hospital where doctors diagnosed Abraham with End Stage Renal Disease and put him on dialysis. Shortly after, it was discovered that he carried a rare gene that put him at a high risk for cancer. Doctors advised removing both kidneys. In July 2012, both of Abraham’s kidneys were removed and catheters were placed in his tiny body along with a feeding tube. By 2013 he had endured over six different surgeries to remove old catheters and replace them with new ones. At one point doctors performed an emergency surgery due to internal bleeding in his liver and intestines. Although Abraham was placed on the list to receive a kidney transplant, when a kidney became available it turned out that it wasn’t a match. Over the last few years, each time he had been eligible to receive a transplant, bacteria was found in his catheters and he was taken off the list. Abraham undergoes three hours of dialysis three days a week and gets all of his nutrition from a feeding tube. He desperately needs a kidney and is back on the transplant list. His family must keep up with all the costs of medication and supplies to properly care for him. Despite all of these challenges Abraham is a sweet little boy who loves cars of all kinds. He likes coloring, Hot Wheels and playing Mario Kart. Abraham will be adopted as a Sparrow to Tigard High School. Students will work hard to raise money for Abraham through sponsored community service and fundraising.